The views of mountains and foliage are well-worth the trip to Whistler. However, without the clarity of clean windows, the accumulated dirt and grime may take away from the experience. With regular use of Whistler Window Cleaning, you can leave those worries behind. Let us help you enjoy the experience from inside your residence or business. Statistically speaking, the fear or heights, or Acrophobia, is the 5th most common fear among most Canadians. Getting up on a ladder may seem innocent enough but falling is not! The leading cause of workplace injuries in British Columbia are falls off ladders. If these types of accidents happen to professionals, they can happen just as easily to a home or business owner. When it comes to personal safety, leave it to the professionals. The Gorillas are happy to help using up to date safety equipment to get the Whistler Window Cleaning done safely and effectively. There is nothing worse than finishing the last wipe of the last window on your property and finding that there is residual dirt or streaks left behind. Although it may be disheartening, it is not your fault! With expert technicians and tools of the trade, our Gorillas are able to prevent these annoyances and provide a proper Window Cleaning. The main focus of Whistler Window Cleaning in most homeowners is the aesthetic value, however, leaving dirt and debris to sit on windows can cause the materials to degrade, leading to permanent damage or replacement. Our technicians use rubber squeegees as well as eco-friendly cleaning solutions. This way, we are able to maintain a streak-free visual appeal, as well as the integrity of the windows themselves. 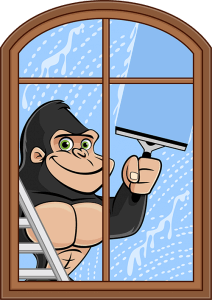 Our Gorillas are here to accommodate your needs for Whistler Window Cleaning on structures up to three storeys. We don’t stop at the surface of the window but maintain the cleanliness of sills and frames as well.